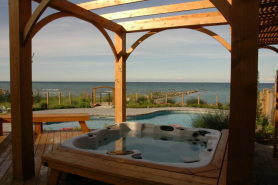 Scott and Linda Stewart would often walk the property they’d bought just south of Meaford, Ontario, imagining the dream home they’d build on the 50 acres overlooking the Beaver Valley. And it wasn’t long before a hill commanding stunning views of the valley presented itself as the perfect location for their country estate. There was just one problem. The land sloped rapidly away from the side and back of where the 6,500 square-foot house would stand, leaving no suitable location for the outdoor pool and living spaces the Stewarts envisioned. The terrace would need to be created. A man-made terrace fits naturally into the landscaping. 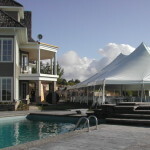 Inspired in part by visions of a spectacular outdoor wedding reception for their daughter, Jennifer, the following summer, the couple began to imagine a series of outdoor “rooms” of various sizes and moods – quiet contemplative nooks and grander spaces ideal for gatherings – all framing views of the valley’s splendour below. 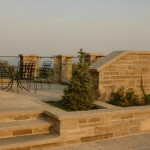 And they called in Mark Higginson, of Natural Stonescapes in Meaford, to design and bring to life the landscaping they dreamed of. 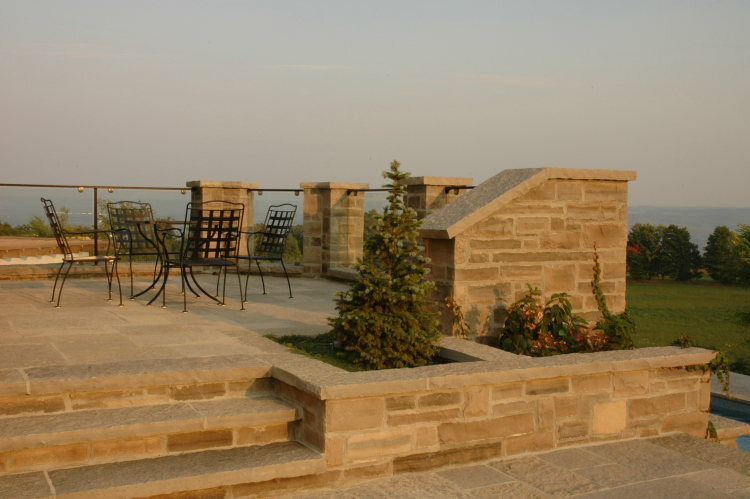 Construction was already underway on the house, when Mark began working with the Stewarts to design a grand, formal outdoor living space, offering discrete areas tied together by clean lines and native stone and plants. The couple imagined a series of outdoor “rooms” – quiet contemplative nooks and grander spaces ideal for gatherings. The swimming pool, bounded by a raised platform and a Zen-inspired waterfall, would anchor the formal lines of the layout with its striking sharp geometry. 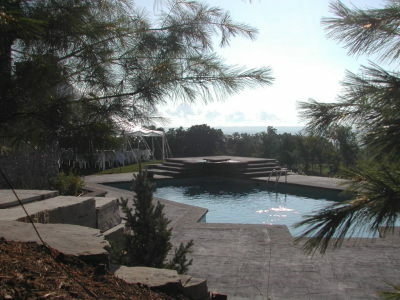 People would approach the pool from a wide grassy terrace on the lower level, or down a dramatic stone stairway from a raised patio on the main floor level. 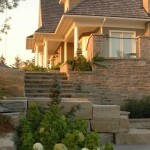 A second water feature on a higher level would frame the far side of the house and the lawn. 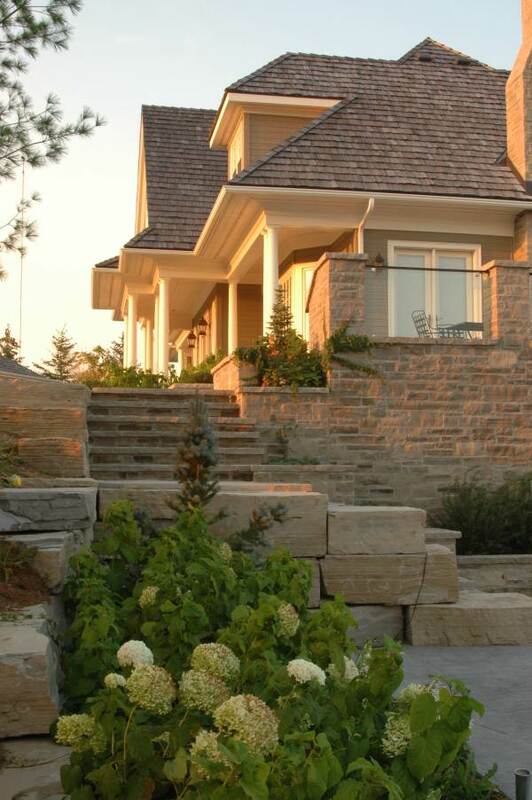 Before work could even begin, Natural Stonescapes needed to construct the raised terrace on which to construct the pool and the lawn. This had to be done well ahead of time, so it would have time to settle before construction began. 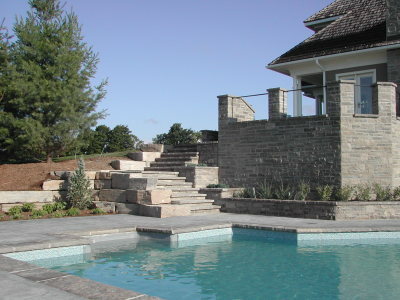 Dramatic stone steps descend to the swimming pool deck. After the team unloaded 3,000 yards of fill, ringed it with stone retainers, and let it settle over the winter, the terrace had begun to take shape. By spring, Higginson’s landscaping team could get to work on the next phase of the hardscaping. Salt water in the 20′ x 40′ foot steel and vinyl lined swimming pool is heated by solar panels hidden off to the side of the terrace. And the cantilevered stone coping that defines the pool’s edge merges seamlessly with the surrounding stamped concrete deck. 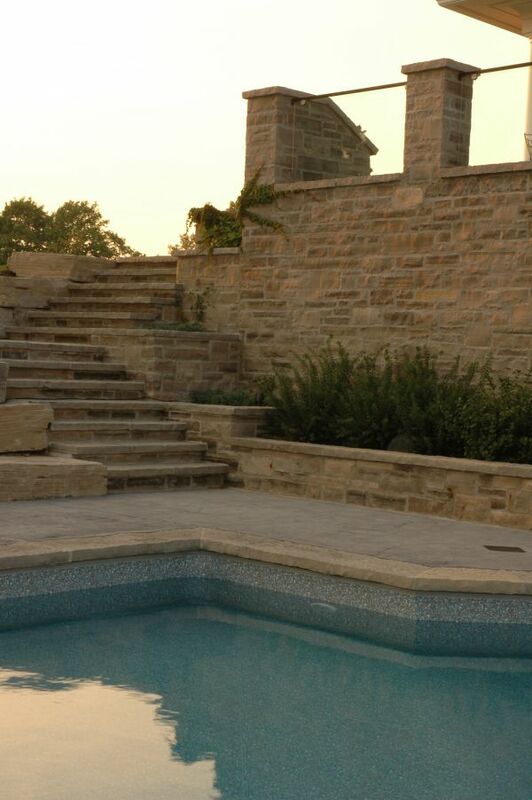 Above the pool, Natural Stonescapes built a raised patio encased by stone-clad pillars and tempered glass walls. From here, family members and guests can look down at the swimming pool and the valley views beyond or, enticed by the refreshing water below, descend a stairway to the pool deck. 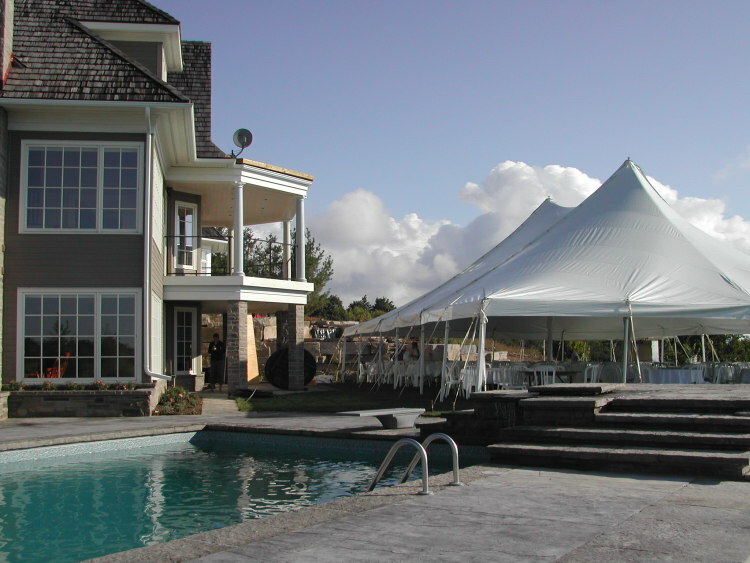 The wedding went off without a hitch, and while guests knew the landscaping was newly done, they marvelled when they learned exactly how much the landscape had been transformed; it looked like it had been there forever. “Under an unforgiving deadline, Mark translated our vision into reality,” says Scott.